The Digium TDM400 Series of PCI Cards has been discontinued by the manufacturer and is no longer available. The direct replacement is the Digium A4 Series. For more information or if you have questions, please call 800.398.8647. 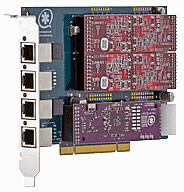 The Digium TDM401E is a 4-port modular analog PCI 3.3/5.0V card with 0 station and 1 trunk interface(s). This card features a Digium VPMAT032 Echo Cancellation card. 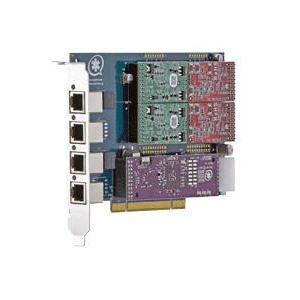 The Digium TDM410 is a half-length PCI 2.2-compliant modular gateway card for connecting analog telephone stations and analog POTS lines through a PC. It supports a combination of up to four station or trunk modules for a total of 4 lines. Using Digium's Asterisk software and standard PC hardware, one can create a telephony environment that includes all of the sophisticated features of a high-end business telephone system.